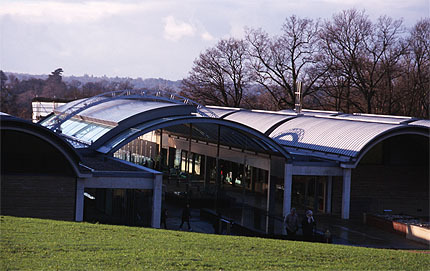 The core of the Millennium Seed Bank - officially the Wellcome Trust Millennium Building - is an underground frozen vault, which preserves the world's largest collection of seeds: three million individual seeds, already covering nearly all the UK's flora and with plans to hold 10 percent of the world's dry lands' flora. Organizationally part of the Royal Botanic Gardens of Kew in west London, it is a future-looking project built with funds from the Millennium Commission and its future-oriented commercial sponsors. 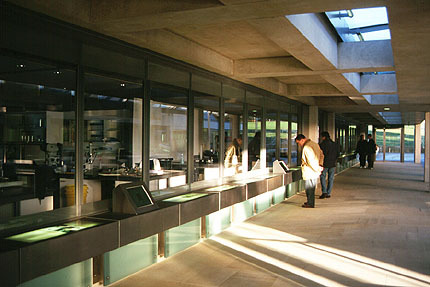 In addition to its exhibits, the museum is built to allow direct observation by the public through large windows into the laboratory areas, where the lab staff are permanently on show as they work. I don't know what the lab staff think of this - in part because I, presumably like many others, visited at a weekend, when most of what you see though the windows are pristinely kept work tables. 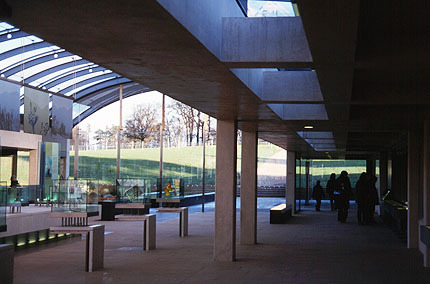 The Millennium Seed Bank is open to the public and located within the estate of Wakehurst Place, also part of Royal Botanic Gardens of Kew. It is located North of Ardingly, West Sussex on the B2028, five miles southeast of Exit 10A of the M23 motorway (and about eight miles southeast of London Gatwick Airport). The last bit is on local roads, but with good signposting to Wakehurst Place (brown signposts). Wakehurst Place has a large garden with a variety of walking trails, well worth a visit at the same time. The Millennium Seed Bank's web site, with visitor information and more detail on both the building and the seed bank project, is at www.rbgkew.org.uk/msbp/index.html.